Place Sweet potatoes on a baking sheet. Bake for 1 hour, or until completely baked. When cool enough to handle, slice sweet potatoes in half lengthwise. Use a spoon to scoop out the orange flesh and place it in a large bowl. 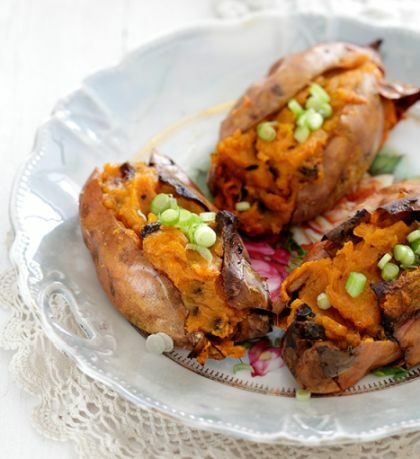 Reserve the sweet potato skins. In a large bowl, mash the sweet potato flesh, adding the orange juice, cinnamon, sea salt and raw sugar/maple syrup. Garnish with thinly sliced green onion if desired.